We are so excited about this year’s Summer Camp! We have many new exciting things planned for your children all summer long. In order for your registration to be secured, We must receive a signed application and payment for first week or attendance. You can print the form online from the parent’s page and bring it to us and make payment online by clicking pay tuition or can come into our location to get application and make payment at that time. Please remember that payments must be received every Friday for the following attendance weeks. There will be a $20 late fee charged if we receive payment on Monday of the same week your child will be attending. During this summer, children must break a morning snack and a lunch. There will be an afternoon snack provided to your child. Breakfast is not provided. Children can be dropped off no earlier than 7:30AM. Official camp instruction begins at 9:00am. Between 7:30-9:00am, children will enjoy movies and table games while everyone arrives. Pick up is no later than 6:00PM. There is a $20 late fee penalty for children picked up after 6:00PM. On select “wheels Day”, Children can bring anything with wheels (i.e, bikes, skateboards, etc) as long as they bring a helmet. These items must be taken home daily. We will notify you the day before when this is ok. It is mandatory campers to bring water bottles. We will engage in many activities both in and outside. Each month we will take daily field trips. 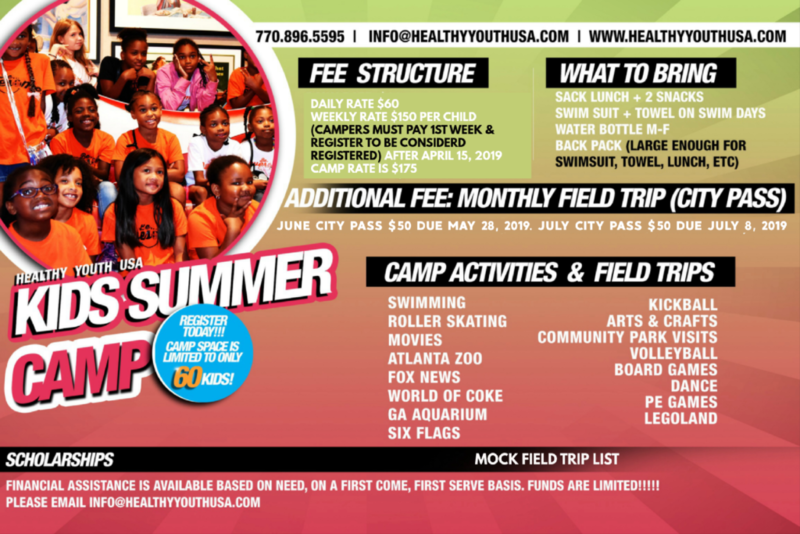 All trip fees are included in your monthly field trip pass that is due at the beginning of the month. Field Trips include weekly skate, swim, parks, monthly cookout. World of Coke, Channel 2 News Tour, Stone Mountain, Legoland and More. More details will follow each week.